When merged in just the right way, rustic and industrial styles can make one happy marriage. 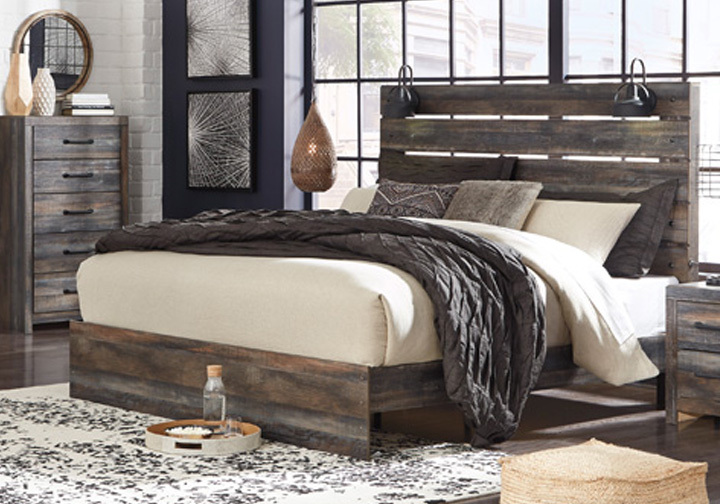 Case in point: the Drystan king panel bed. A refined take on barn board beauty, its complex, replicated wood grain showcases hints of burnt orange and teal tones for a sense of weatherworn authenticity. Love to read in bed? You’re sure to find the pair of retro-chic light sconces and USB plug-ins on the open-slat style headboard such a bright idea. Burnt orange and teal colors accent a brown rustic finish in a replicated woodgrain with authentic touch. Large scaled dark colored handles. Cases feature a framed front and pilasters. All panel headboards (53,57,58,87) feature decorative sconce lights. Side roller glides for smooth operating drawers. All panel headboards (53,57,58,87) can attach to a bolt-on metal bed frame B100-31 or B100-66 respectively. Drawers lined with a faux linen laminate for a clean, finished look. Slim profile dual USB chargers located on the back of the night stand top and the side of the headboards. All side storage options (50,150,60,160) requires the use of the B100-13, B100-14, B100-31 or the B100-66 roll slats. All under bed storage units (50,150,60,160) accommodates to 10.5″W x 10.5″D x 11″H cube storage bins. LED lights accent bookcase headboards (63,65,69,85). All beds have a panel footboard (52,84,54,56) and storage footboard option (52S,84S,54S, 56S). Queen (65) and king (69) headboards can attach to a bolt-on metal bed frame B100-31 or B100-66 respectively. Twin (63) and full (85) headboards can attach to a bolt-on metal bed frame B100-21.